The Doctors Diet is developed by Dr. Travis Stork, the co-host of the television show, The Doctors, and a practicing board-certified emergency medicine physician. Dr. Stork says that very often it is too late when people come to the emergency room. This is why he wants to provide individuals with information to avoid preventable illnesses related to obesity before they occur. In The Doctor’s Diet he offers readers a flexible and practical diet plan for weight loss, disease prevention, and longevity. Most people don’t realize they make about 200 health-related decisions every day. These choices influence their well-being and ultimately how long they will live. Paying attention to these seemingly unimportant decisions is what creates good health. Stork discusses how weight-related health complications are the most significant cause of death for Americans. He also highlights some of the potentially fatal health risks associated with an unhealthy diet. The foods you eat will influence how healthy you are and how long you live. However on a day-to-day basis, he says we haven’t made the connection in our minds yet. Everyone knows they are supposed to eat healthy but this isn’t translating to actions in our everyday lives. Dr. Stork believes health is not achieved by spending hours in the gym or following deprivation diets. You can be healthy, and yet, still love food. You can actually use food as your medicine … and enjoy it, and lose a lot of weight. In the Doctor’s Diet Stork highlights specific foods that can act as medicines to produce immediate results. Many people don’t display symptoms if their blood pressure or cholesterol is high. The first symptom may be a heart attack says Stork. So he recommends getting those numbers checked regularly then working in collaboration with your doctor to get them in a good range. Regarding calorie intake, most people have no idea how many calories they should be eating on a daily basis. We often eat two or three times as many calories as we need. The Doctors Diet encourages you start monitoring portion sizes and calorie amounts, it doesn’t take a lot of effort to reach your optimal weight. The initial phase lasts for two weeks. It is low in calories to jump-start your weight loss. This is where you learn how to reset your taste buds and let go of unhealthy eating habits. The diet in the second phase is a bit more flexible. You will continue with this phase until you achieve your goal weight. Dr. Stork says this is basically the plan he follows in his own life. It is designed to maintain your ideal weight and support general well-being. Foods you can expect to eat on The Doctors Diet. Salmon, shrimp, cheese, Greek yogurt, eggs, whole-grain bread, whole-wheat pasta, black beans, lentils, almonds, spinach, sweet potato, tomato, lettuce, mushrooms, broccoli, cauliflower, avocado, berries, peaches, apples, bananas, honey, popcorn, olive oil, red wine. You don’t have to spend hours in the gym to achieve your health and weight loss goals. Exercise is not supposed to be a job. Exercise is not supposed to be work. It’s supposed to be fun. Get out there, enjoy yourself, and be active. 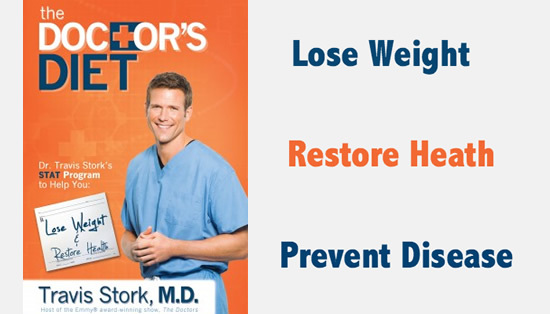 The Doctor’s Diet: Dr. Travis Stork’s STAT Program to Help You Lose Weight & Restore Your Health retails at $25.95. Encourages readers to take a proactive role in their health. Designed to prevent serious diseases before they manifest. Offers a flexible plan that can be adapted to individual needs and preferences. Based on scientific research and the opinions of a well-renowned health expert. Includes healthy recipes with vegetarian options. Those with serious health conditions will require more specific dietary guidance. Requires elimination of certain foods, especially during the early stages. Dieters may experience hunger and other symptoms as they adjust to the diet in the first two weeks. The Doctors Diet combines healthy diet and lifestyle strategies from a renowned doctor into a flexible and practical plan. On this program you can achieve your ideal weight while enjoying delicious foods that prevent disease and support lifelong health. I would like to lose weight but I don’t know how. My father had a disease vascular disease.the doctor said it’s called cardiovascular disease,I would never in my entire life I would be the only one that had this problem,I already lost one of my foot,I don’t know if the Doctor new what he was doing,because I went in this doctors office walking and I came out with out a foot,Now I don’t trust any doctor s if I am going to die I want to die with my who body.Right now I am trying todeal with the situation,I don’t know how to handle this . I have had so many skin grafts,and it scares me to go see a Doctor because I trusted this doctor and all he was doing is making money off me because I had a good insurance,my father he die of this disease I don’t want to die like that please see if you can helped me. Because I don’t want to live like this. I was very active,I was very independent,and now I feel trapped.I don’t want to go any where, when they did all this surgeries to me They ruined all my veins on my arms.I end up with a lot of hematomas on my arms and legs.And where they cut my foot off I have a very bad scar it did not close right.it looks horrible.and then I end up with an infections on my stump I almost died.I was in the hospital for a month.and that was last year.actually I had three infections.I ended up in a hospital for diseases.some specialist took over specialist for Diseases control took over my case.I could tell you everything that happened but this is just the tip of the iceberg.sincerely yours Josefina Bledsoe. When done properly, you won’t feel hungry. Dr Stork specifically tells you if you do feel you need a little more then anytime veggies are good to go. The key is not to absently eat, but eat with purpose. Don’t watch TV, or read email, or drive, etc., but eat with the intent to know what you are putting in your body. When you do that, your body has a chance to perform properly and you won’t feel hungry when following the diet. And it isn’t really a diet, it is a life style change. That is more important to remember. I have lost 27 pounds following this diet and I am 6 weeks into it. I feel better and feel slimmer. I needed to lose 82 pounds to get down something reasonable with a total goal of 110 pounds. I am 5 pounds from my first goal, and really want this for myself and my family!